D&D fourth edition was considered by many to be something of an RPG war-crime. I bought the books, but never played it beyond a forum campaign I briefly ran. To be fair, I was most familiar with the second edition rules – I was so comfortable with that ludicrously overwrought rule-set that I mentally calculated THAC0 as a free action. The fourth edition by comparison was effortless although it did seem more like the MMO version of a much more complex game. I quite liked it, in other words – not enough to be a passionate defender, but certainly enough to find the strength of negative feeling exhibited online to be somewhat out of proportion. That’s par for the course for the internet though – it’s an engine for attention fueled almost entirely by inarticulate outrage. If you want to know the approximate flavour of fourth edition you can get a credible taste by chewing on the edges of the Legend of Drizzt. Given the box can be enjoyed as a solo affair, that does admittedly suggest that the streamlining inherent in the system perhaps veered on occasion into over-simplification. What a ledge! Archbishop of Banterbury! Now, let’ me row that back a bit. This isn’t ‘D&D in a box’. It isn’t a viable alternative for an actual role-playing session. It’s not even a good candidate as a dungeon crawler. It doesn’t have persistent advancement, a meaningful campaign, or even particularly interesting gameplay. It does though manage to pack a decent amount of tactical play into a reasonable play-length. It manages that in such a way as you can gain at least a passing appreciation of the way that a proper tabletop campaign might work. And it does all of this without having to sacrifice a player to the DM role, or rely on an external digital app to direct proceedings. It started with a Drizzt. I never thought it would come to this. 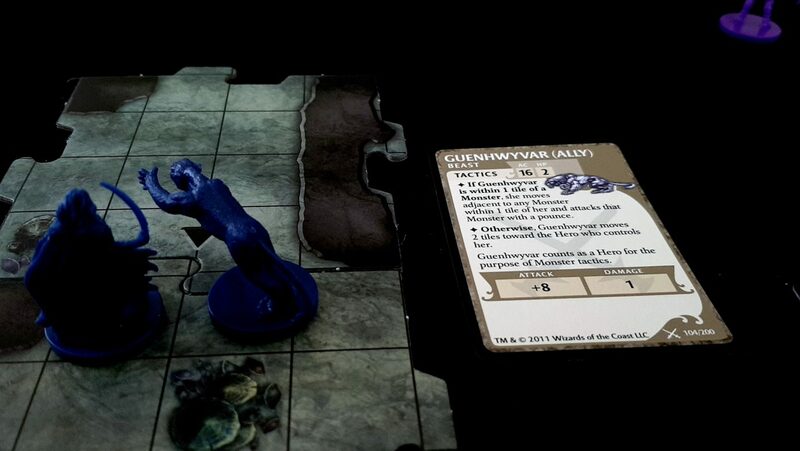 The Legend of Drizzt works through the construction of an expanding maze of caverns that our adventurers explore. 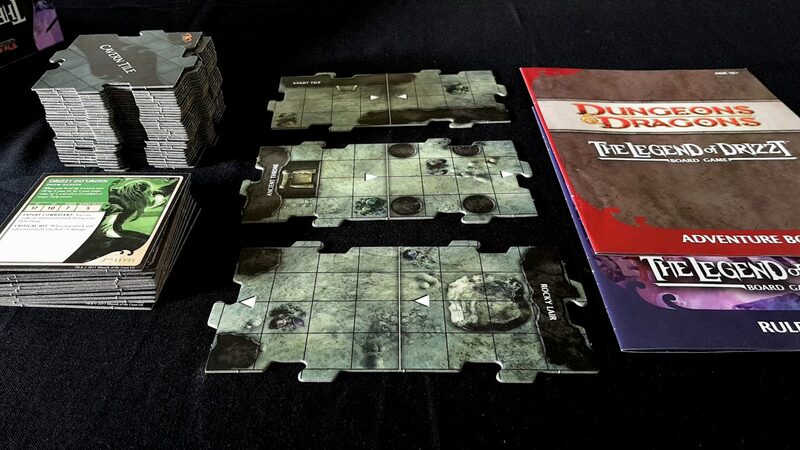 We pick a scenario from the adventure book, follow the setup instructions for populating the cavern draw pile, and then we begin play from the start tile. 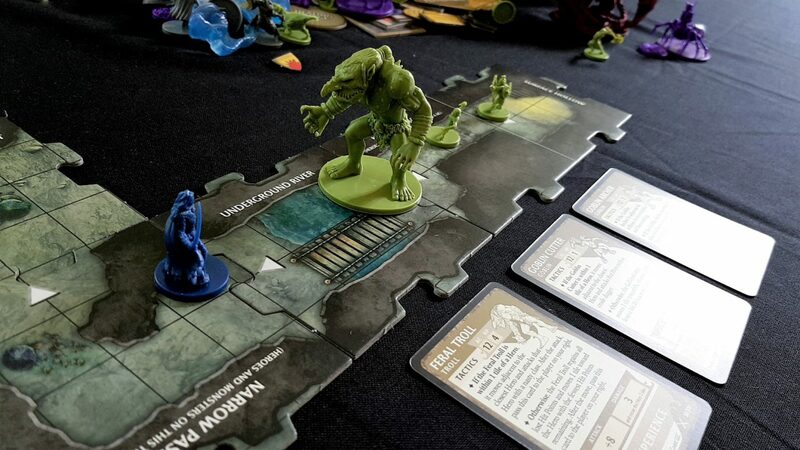 We pick from a roster of heroes, which includes the titular Drizzt himself, and then work together (usually) to find the cavern tile that signals the end-game climatic battle of the session. Sometimes we mix it up with a competitive scenario in which we’re racing to beat our comrades to some game goal, and in others we work with a fixed cavern and a set victory condition. We’ve got trophy hunts, sieges, and fearsome battles against a roster of powerful villains. Most of the scenarios though play the same way – start, explore, find the end-point tile, and face a boss and their hirelings. As well as a big-base drider and a shadow dragon. The dragon seems a little small. Like a house-cat. That’s a lot of compression moulded plastic in a single, massive box. 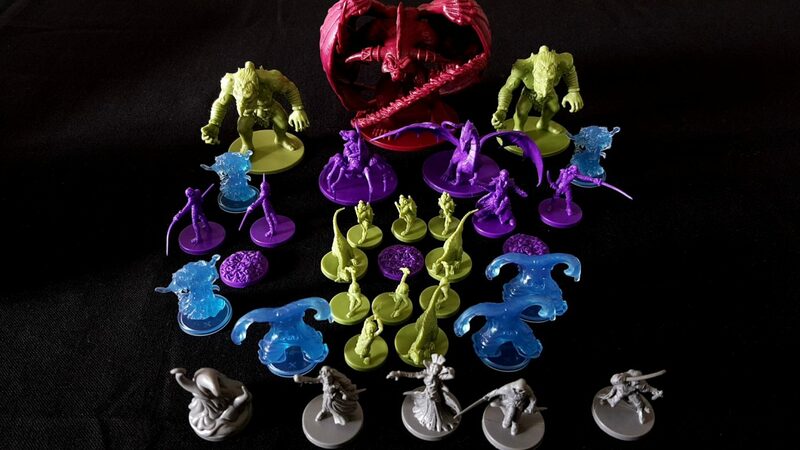 We also get our heroes – those of you who are fans of the Drizzt series of books and campaign supplements will find a pleasing amount of fan service in the roster of heroes you can recruit to the cause. Catti-Brie is here! So is Athrogate with his twin morning-stars! Wulfgar and Bruenor too! And Regis! And of course, there’s Drizzt himself. Picking a character is a non-trivial task for play since each of them are handled in a meaningfully different way. Drizzt can deal out a lot of damage and summon his astral panther companion to support in battle. Wulfgar can dish out ridiculous amounts of pain and becomes more dangerous the more wounded he becomes. Bruenor can make use of rerolls to precisely dismantle foes, and chug his dwarven ale to heal in a pinch. Catti-Brie is quick and agile, able to dance out of trouble and take foes down from a distance. Absolutely everyone has something to offer, and you’ll even get to build them for the scenario by choosing between the range of powers they have available. 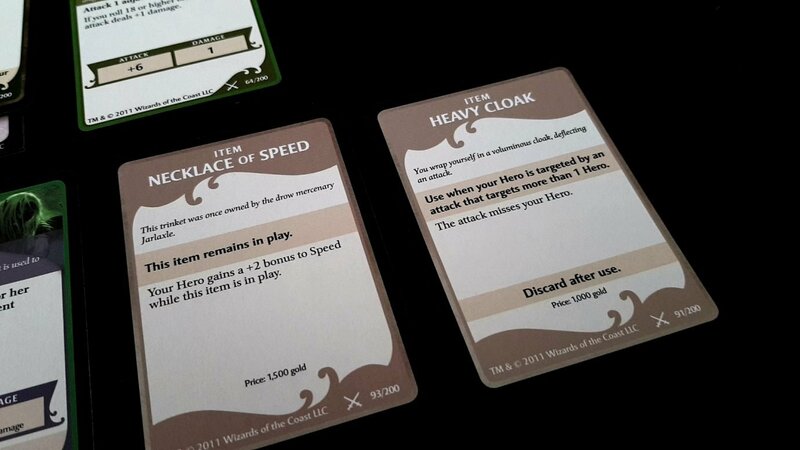 We usually start the game too with a random treasure drawn from the treasure deck – that’s why our Drizzt, as arranged above, begins with a necklace of speed. We also begin an adventure with a certain number of ‘healing surges’. These are a group resource, spent whenever a hero hits zero HPs. When that happens, they get their ‘surge value’ in HP back, and the surge is removed from play. If playing an adventure solo, you’ll often get two surges to yourself. If playing with a party of five, you get two surges between everyone. Healing in other words scales to the challenge. It’s a hugely important benefit you bring with you into your adventures. That handmaiden of Lolth looks very Cthulhuesque. And you’ll be doing this in the great expanses of the mysterious and deadly Underdark. You’ll be battling in the corridors of Mithral Hall and hunting for the ruins of Gauntlgrym. It all ties nicely into the wider lore of the Forgotten Realms, permitting deeper fans of the series the occasional grin of recognition as the scenarios progress. Not all of these are in use in every scenario, but there are enough of them that come regularly into play that managing and organising them can be a chore. Some heroes have stance tokens you’ll be juggling between various powers, while everyone will be accumulating damage, poison and curses. The game state can get very busy, as you can undoubtedly imagine. For a game that isn’t especially complicated, there sure are a lot of things of which you need to keep track. There’s a nicely regulated tempo to play. 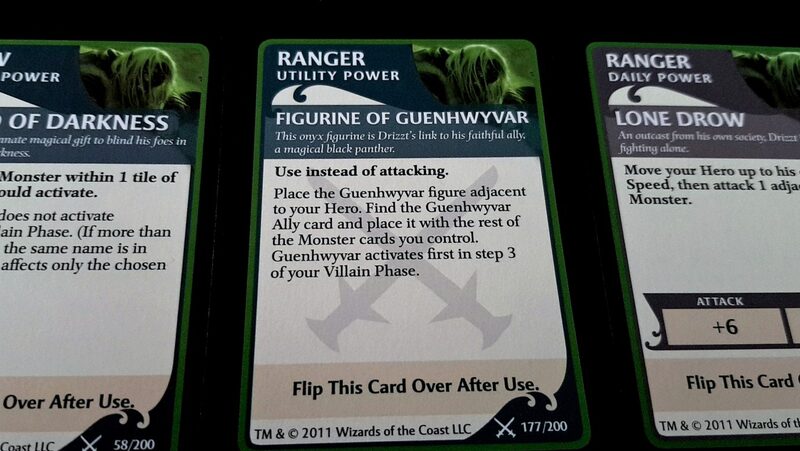 First you have a hero phase, where you can move and attack and use your various powers. This is where you get to be Big Damn Heroes, cutting up your foes and maneuvering around the dangerous places of the caverns. Each hero can move twice (each time, moving up to their speed value), move and attack, or attack and move. 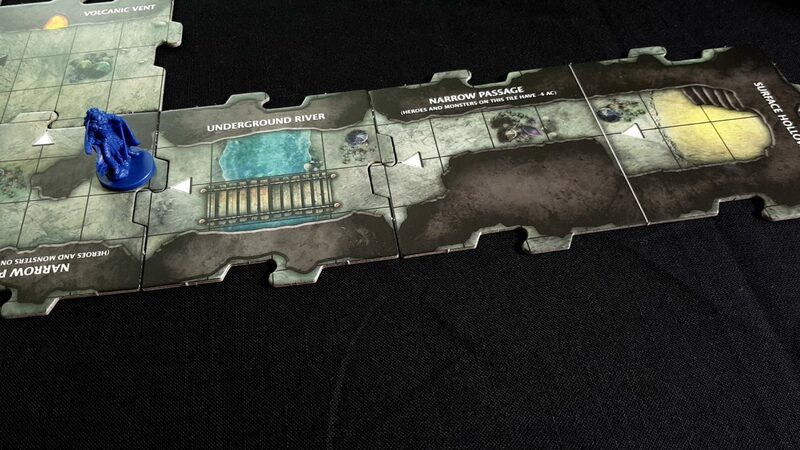 If any hero ends their hero phase on the unexplored edge of a cavern tile, a new tile is revealed. Each tile has an arrow, and we point that arrow facing the edge where we are standing. This is the exploration phase. When the tile is revealed, a monster is drawn and placed on the mushroom patch each new part of the cavern has. It was essentially sitting there, eating a packed lunch and waiting for knocking off time, when your interfering busybody of a hero wandered in on them. They are, understandably, pissed. 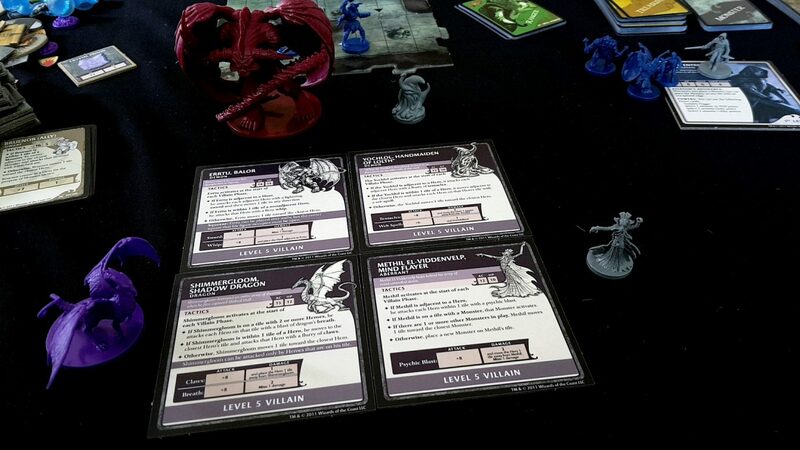 The monster cards contain a kind of rudimentary scripted AI – the player that draws the monster takes control of it, and follows the programming on the front to handle its combat logic. Everyone can control a maximum of one of each creature at a time – you can control a goblin archer and a goblin cutter, but not two of either. We’re in the territory of the Dark Goddess Lolth, and she has no truck with adventurers like us. The curse card in the deck sticks to us like a maggot in an open wound – every time it’s drawn, everyone with a curse card takes damage. There is rarely anything good in the encounter deck. 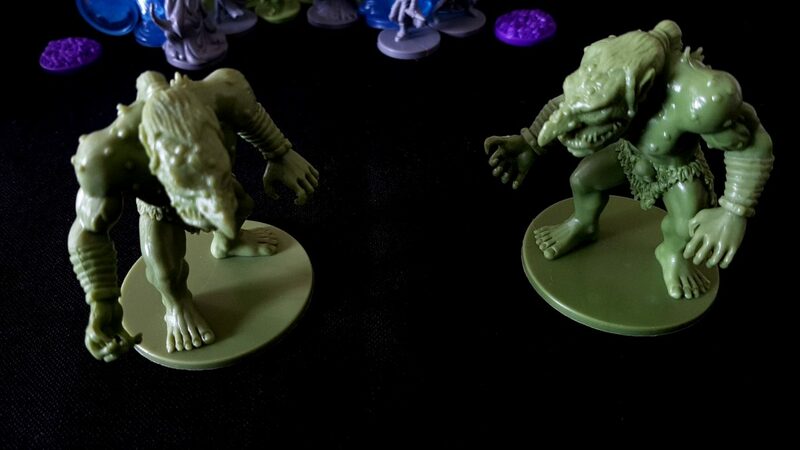 Once the encounter is resolved, we move on to NPCs – whatever monsters a player is controlling rattles through their associated combat logic. Sometimes, for especially dangerous enemies, when they’re done with their turn we pass their card on to the next player. Otherwise, they only act when we act – that is, unless there is more than one of them in play at a time, in which case they all act at the same time, every time a player activates any one of them. That’s a bad time for everyone. – we don’t want NPCs to mass. With our goblin archer, we got lucky – it’s adjacent to a player, and so it just cowers in fear. If it was further away, it would launch an attack. 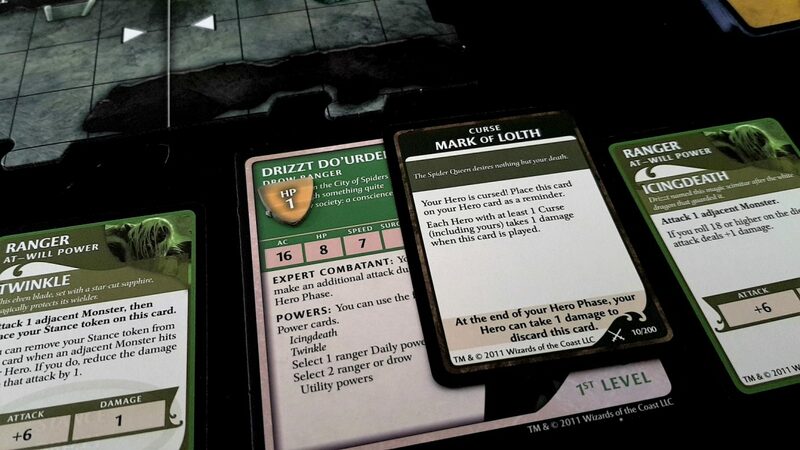 Attacking in Legend of Drizzt is as simple as rolling a d20, adding the attack bonus, and comparing that against the armour class (AC) of the target. If you hit, then you do the damage indicated. If you don’t, you do whatever miss damage is listed. 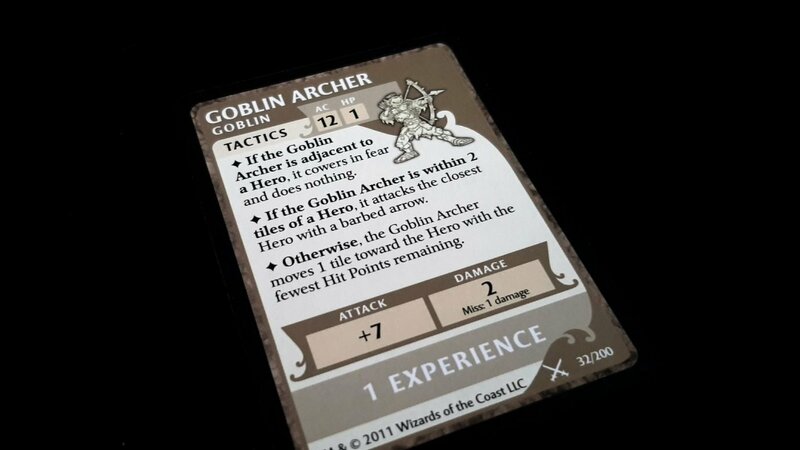 The goblin archer will do two damage on a hit, and one on a miss – we’re lucky then that it’s right by us. It, on the other hand, is not lucky. Drizzt makes use of his icingdeath at will power to attack. He rolls a fourteen, adds the six bonus from the attack, and slices through the goblin’s AC of 12. It has a single HP, so it dies, and gives us one experience point (as marked on the bottom) and we get to draw a treasure from the deck. The experience can be used to level up (if we have five experience points and roll a natural 20 in an attack or disarm operation), or to cancel encounter cards once they’ve been drawn. Experience is a party resource though, so you need to be careful to spend it wisely. Leveling up, as you can imagine, gives you a power boost – your AC goes up, your HPs go up, and the value of your surges too increases. Usually you’ll also get a secondary passive power that will go a long way to ensuring your survivability in the dark places of the Forgotten Realms. Treasure comes with a price listed along the bottom, but it’s not important in Drizzt – what matters is what we can do with it. Some give permanent effects (like our necklace of speed). Some are situational. Others give us an instant boost or short-term benefit. This gives him another NPC to control, but this one is acting in his favour. She’ll activate during the villain phase, adding a little oomph to his combat. He doesn’t get to direct her, but she’ll be happily tearing shreds off of the same enemies on which he’s focusing. Oh look, the light was a train. With a troll on it. The final battle is usually against a named opponent, along with some drawn randomly from the deck. That’s a deck that might contain sword-fodder like goblins with knives, or mini-bosses like trolls or driders. 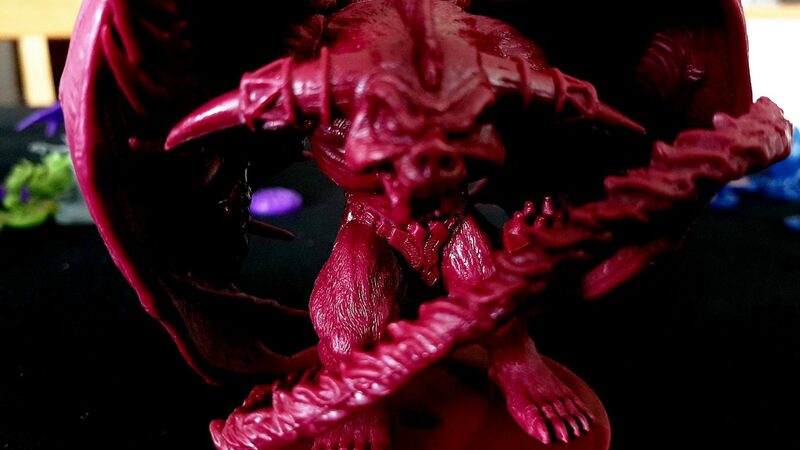 Every single encounter through the Underdark is going to cost you – sometimes it’s just time, but more often it’s health and access to your powers. Aside from your at-will powers, the others can only be refreshed by occasional moments of fortune from the treasure deck. As such, every battle must be weighed up – the chance of surviving this one versus winning the big engagement at the end. 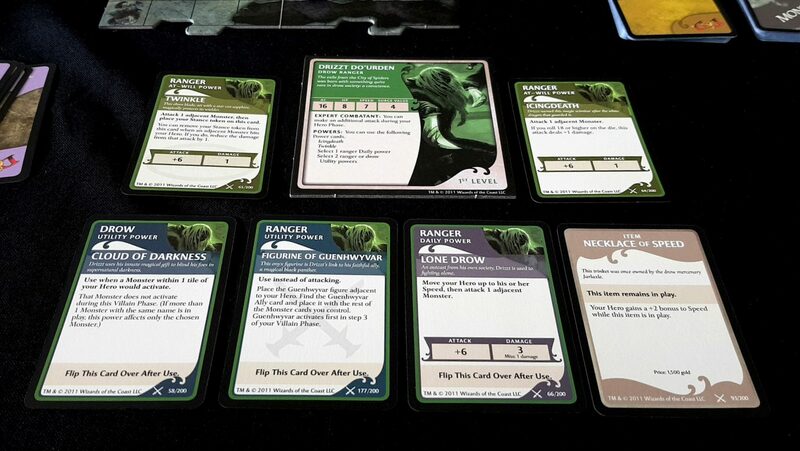 There isn’t a lot of strategy in Legend of Drizzt, and what’s there is primarily about the economics of fatigue. Every engagement will take something out of you. You just need to make sure you arrive at the final battle fit enough, with enough tricks up your sleeve, to make it through to the end. You can probably tell from this that Legend of Drizzt isn’t a deep game, and it really suffers from a lack of a coherent progression system that spans the scenarios. There is something akin to a meaningful narrative in the adventure book, but it’s only cursory. 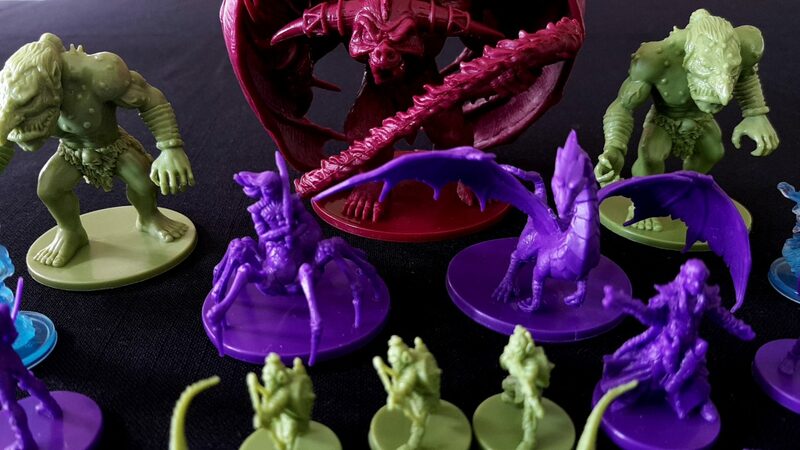 Aside from the fact that from adventure five onwards you mix some more advanced encounters, monsters and treasures into the decks you’re playing much the same game at the end as you are at the start. The only thing scenarios give you is a narrative framework, and that in itself is neither exciting enough in terms of plot nor interesting enough in terms of writing. It’s certainly true that some scenarios do mix things up a bit, but for the most part they all play very similarly with an almost identical arc of experience – clumsily explore your surroundings, fumble around in the dark, meet hideous and grotesque monsters, fight, reach a climax, and come away vaguely disappointed. A bit like a night out in Falkirk, in other words. 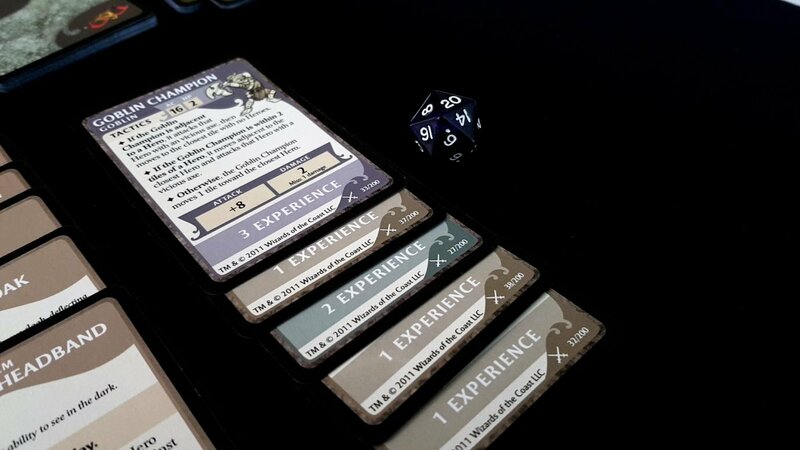 The game is crying out for persistence of advancement – the Pathfinder Adventure Card Game, by comparison, manages this much more effectively even if it isn’t as fun an experience. 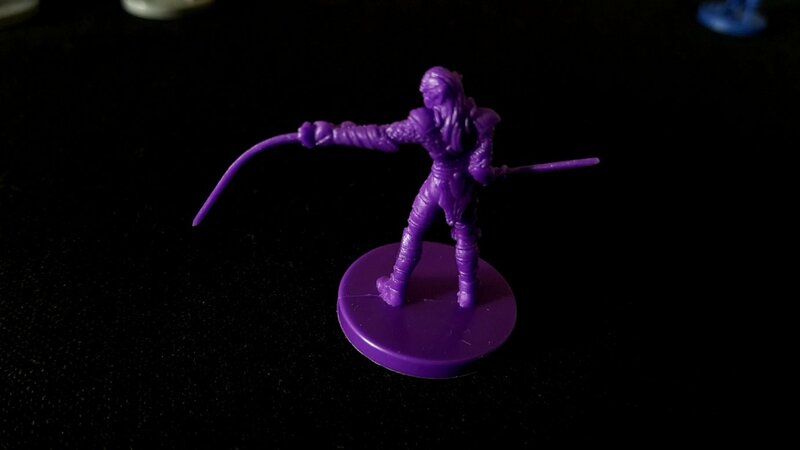 The core game loop of Drizzt is more fun than it should be – it is surprisingly engaging to just wander around hitting things until they fall down. The gradual erosion of effectiveness that accompanies the encounters and exploration lends it a nice tension that feeds into sustaining an agreeable amount of pace. You definitely draw an encounter if you don’t draw a tile, and only sometimes if you do. It incentivises exploration, which creates new battles, which keeps everything interesting until the final engagement comes along. It doesn’t outstay its welcome. The monsters themselves behave in interesting ways that mix things up – the rules-driven AI is simple, but not so simple that it doesn’t create interesting emergent behaviour. Some of the rule sets seem weaker than they should be (it would make more sense for the archer to flee to another tile rather than stand in terror, for example), but overall combat is satisfying without being overbearing. I would have liked to have seen positionality play more of a role – its absence in a grid based game is surprising, and limits the opportunity players have to really collaborate well. The whole movement system disincentivises meaningful planning – monsters move by tile, not by square, and even the bases don’t factor into it. You don’t get many chances to set up traps, exploits flanks, or use the terrain to your advantage. The largest concession to the importance of place in the game is that adjacency often matters. As such, Drizzt adopts a strange halfway house between abstract movement and spatial explicitness. It’s not entirely successful, but it’s also not entirely unsuccessful. It just seems that a game that doesn’t offer a sustained dungeon crawling experience would double down on the immediate satisfaction of tactical play. Part of my frustration here comes from the fact that this isn’t a particularly easy game, and a lot of that difficulty comes from the lack of options I have. There are few tools for meaningfully managing the uneven difficulty of the decks. It’s true you can draw nothing but soft-serve ice-cream from the decks and have an easy time of it. It’s equally true you can be brutally wounded in a couple of early encounters and then approach each future engagement with the fixed rictus of panic. 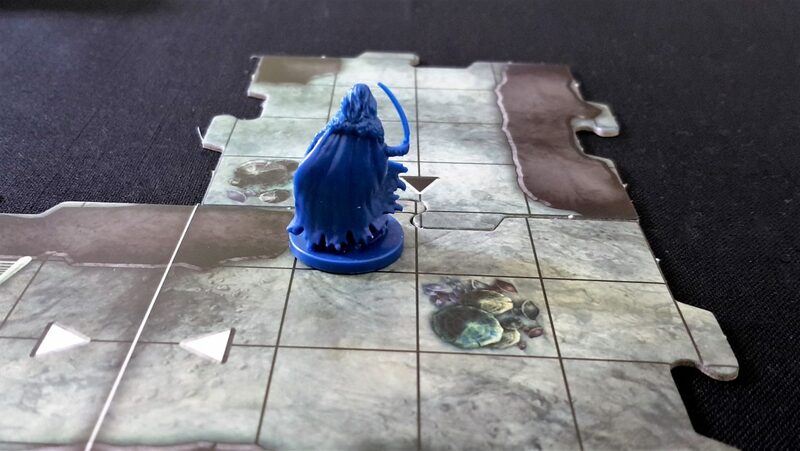 With the hero Drizzt, I can take advantage of his extra attack to move, attack, and move away when dealing with larger creatures but I want to be able to do more of that. I want to be able to lure enemies into rooms where I have positional flexibility, and then whittle them down with clever placement. I want to be able to make use of narrow passageways to get out of the way of trolls, knowing they’re too big to follow. None of that is supported though because the grid-based movement within tiles doesn’t tie meaningfully into the rest of the mechanics. It’s not even as if this is something that house rules can fix. The random construction of the Underdark often creates situations where strict adherence to base movement would render many encounters ludicrously easy to avoid. 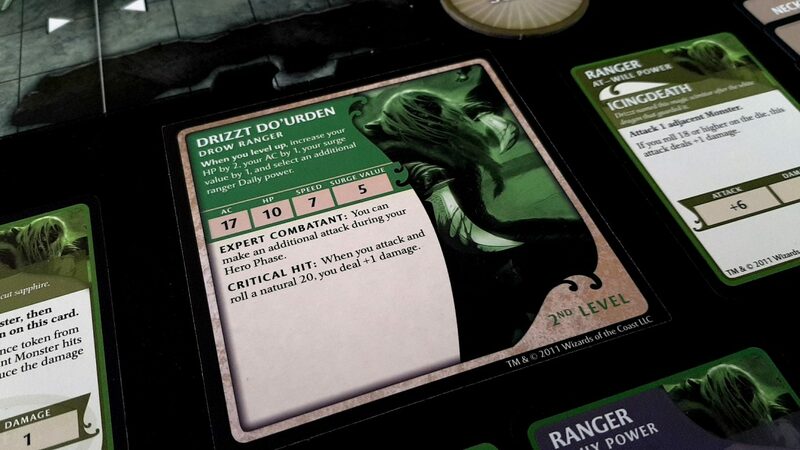 Legend of Drizzt doesn’t thrive then in the tactical design space. As such it has to be driven by the novelty of the gaming experience – in its richness of foes, treasures and encounters. 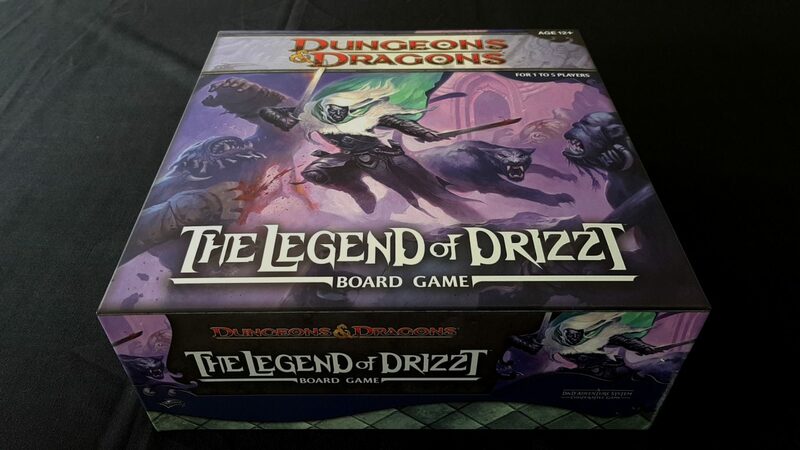 In this it’s clear to me that Legend of a Drizzt is a game that becomes better the closer its proximity to the other boxes in the series. 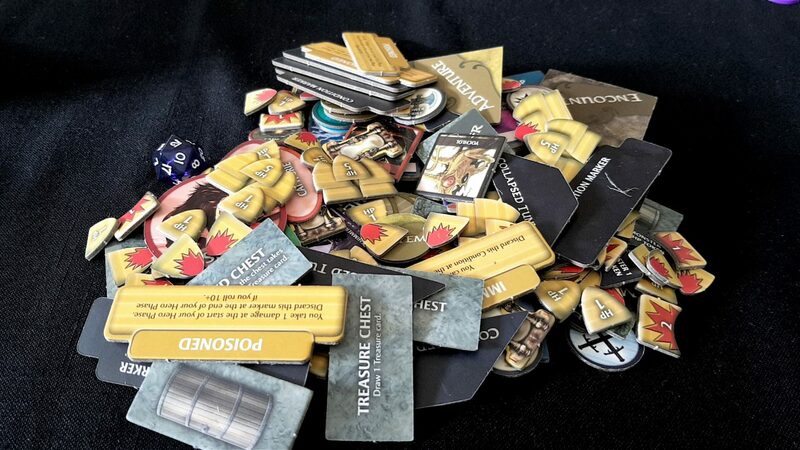 Like a cardboard Voltron each game makes the aggregate experience richer. Every box brings with it new creatures, new treasures, and new opportunities to explore the varied world of the Forgotten Realms. The Drizzt box is generous in what it gives you, but it is a considerably shallower experience than I’d like and it doesn’t take long before you’ve drained it of all its surprises. Some of this negativity has to be tempered by the fact that I have no great emotional investment in the theme of the game. I’ve read some Forgotten Realms. I’ve met Drizzt around Baldur’s Gate. He seemed fine, but even then I wasn’t as awe-struck as I think I was supposed to be. Really, I bought this because every copy of Castle Ravenloft I could find was being sold for $gouge, and I thought ‘this one will probably be as good as any other’. And it is! Good, I mean – it’s an enjoyable experience that does not rob you of your time. It’s not great, like it could be, but it’s definitely something well worth having in your collection. The steady, inexorable pressure to progress creates real moments of solidly effective excitement. 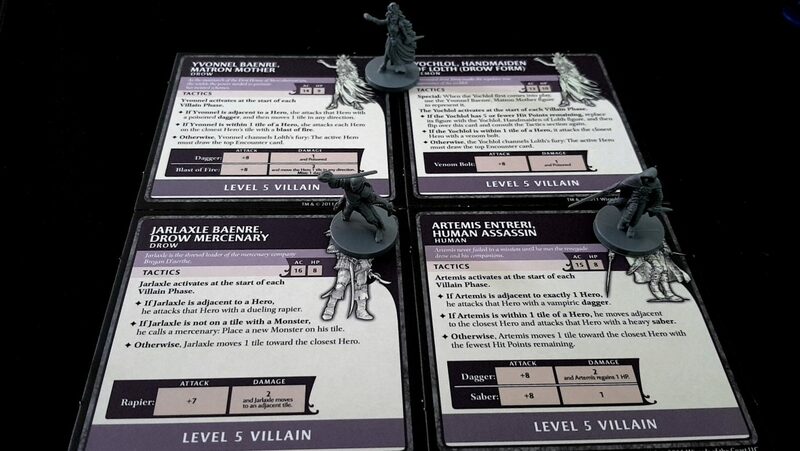 Last night, we limped into the final chamber to meet the fearsome creature of our quest, the assassin Artemis. He was flanked by two goblins, and we were beaten down and drained by our previous encounters. Our surges were gone, our powers spent, and we hadn’t even managed to roll a 20 to spend experience on levelling up. But we gritted our teeth and began the battle anyway, knowing that we were going to lose but it wouldn’t take long. 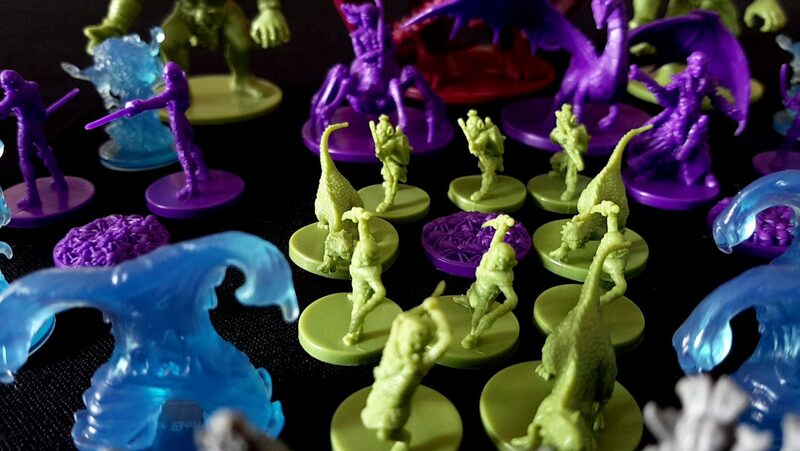 We formed a strike team to take out the goblins while the fighter kept Artemis engaged. Drizzt dealt with the goblins as Artemis inflicted a wound on the fighter. 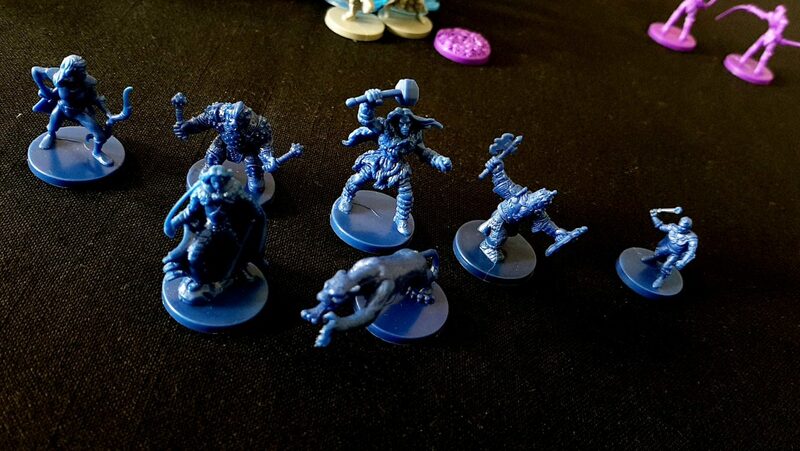 Bruenor fell back just as Drizzt joined the battle, rolled his icingdeath and then… a twenty. An actual twenty! 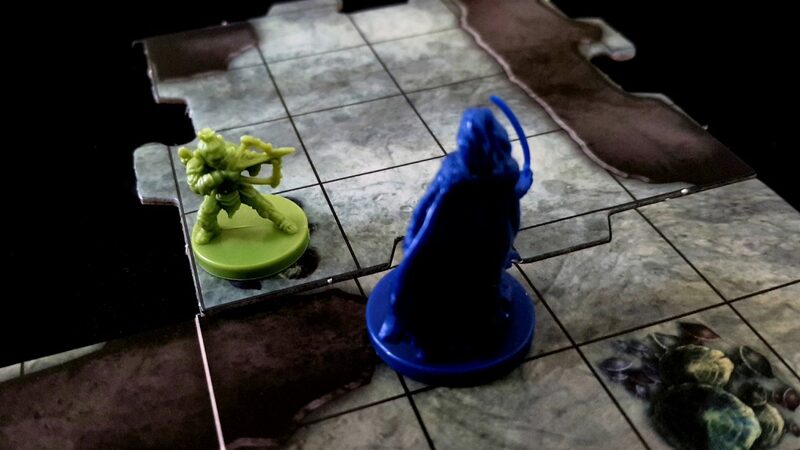 Drizzt levelled up, got a +1 on his damage roll, and made use of a girdle of giant strength to inflict four of the five points of damage we needed to win the battle. Artemis fought bravely, but Drizzt was newly invigorated, and as Bruenor rejoined the fight we pressed home and won the day. That’s what the best kind of games can do – they turn mechanics into moments. I genuinely punched the air when that twenty came up – it changed the inevitability of defeat into the kind of knife-edge battle that could easily become part of the mythology of a gaming group. Not all games permit that kind of ludic alchemy, and I have a soft spot for any title that lets it happen. The Legend of Drizzt has flaws and shortcomings, but it’s got more than enough magic to make it worth your time and attention. Do consider though that if it’s something you’re going to regularly build your nights around you’ll find the siren call of its companion games difficult to resist. It’s been a long time since I read any of the D&D novels – I was always much more invested into Dragonlance than I was Forgotten Realms, I read the Avatar series, if I remember correctly, but my experience with Drizzt is only really in the abstract – I know the general shape of the stories, but I never really connected with them. I’d promise to add them to my ‘to read’ list, but that would be misleading since that list is already long enough to last past my mortal span and well into my own transmutation into Lich form.